We are a few days beyond one of America’s greatest holidays–Independence Day; otherwise known as the 4th of July. What makes this holiday unique and special is that we’re celebrating freedom and independence as one nation. 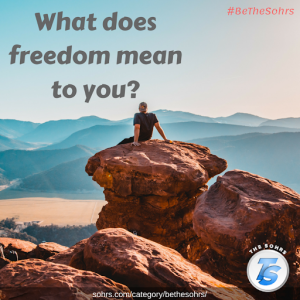 This week let’s continue the celebration by answering this #BeTheSohrs focus question, “what does freedom mean to you?” If nothing more, share an Independence Day photo with us. It’s time, your time to do what we, Christians, do best…#BeTheSohrs! In what ways do you spend time with your family?